​​DALLAS-FORT WORTH – Take a quick look at some recent real estate deals in North Texas. Allen: LFP Real Estate LP has sold 8.44 acres at the corner of East Bethany Dr. and South Greenville Ave.
Arlington: The Greenhouse Apartments, a 40-unit apartment building at 2405 E. Park Row, has sold. 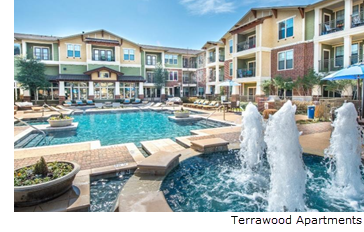 Grapevine: The 291-unit Terrawood Apartments​, located at 3225 Grapevine Mills Blvd., has been purchased by Praedium Group. Carrollton: Fastenal Co. leased 13,948 sf of industrial space at 1605 Crescent Circle. ​Check out DFW Industrial, Multifamily, Office, and Retail Market Research.